A deepening anxiety about the future of democracy around the world has spread over the past few years. Emboldened autocrats and rising populists have shaken assumptions about the future trajectory of liberal democracy, both in nations where it has yet to flourish and countries where it seemed strongly entrenched. Scholars have documented a global “democratic recession,” and some now warn that even long-established “consolidated” democracies could lose their commitment to freedom and slip toward more authoritarian politics. A 38-nation Pew Research Center survey finds there are reasons for calm as well as concern when it comes to democracy’s future. More than half in each of the nations polled consider representative democracy a very or somewhat good way to govern their country. Yet, in all countries, pro-democracy attitudes coexist, to varying degrees, with openness to nondemocratic forms of governance, including rule by experts, a strong leader or the military. A number of factors affect the depth of the public’s commitment to representative democracy over nondemocratic options. People in wealthier nations and in those that have more fully democratic systems tend to be more committed to representative democracy. And in many nations, people with less education, those who are on the ideological right and those who are dissatisfied with the way democracy is currently working in their country are more willing to consider nondemocratic alternatives. At the same time, majorities in nearly all nations also embrace another form of democracy that places less emphasis on elected representatives. A global median of 66% say direct democracy – in which citizens, rather than elected officials, vote on major issues – would be a good way to govern. This idea is especially popular among Western European populists. The survey reveals that large numbers in many nations would entertain political systems that are inconsistent with liberal democracy. For instance, when asked about a system in which experts, not elected representatives, make key decisions based on what they think is best for the country, a median of 49% across these 38 countries say this would be a good way to run their nation. Unconstrained executive power also has its supporters. In 20 countries, a quarter or more of those polled think a system in which a strong leader can make decisions without interference from parliament or the courts is a good form of government. This type of regime is particularly popular in several nations where executives have extended or consolidated their power in recent years, such as the Philippines, Russia and Turkey. 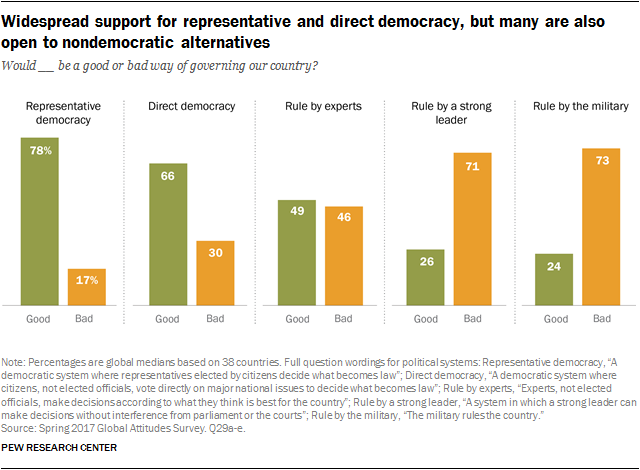 While military rule is the least popular political system tested on the survey, even this finds some support across the globe. Notable minorities in many nations consider it a good way to govern, and half or more express this view in Vietnam, Indonesia, India and South Africa. Roughly a quarter of people (median of 23%) across the 38 countries surveyed are committed democrats. About twice as many (median of 47%) are less-committed democrats. Relatively few (13%) are nondemocratic. A small share (8%) does not endorse any of these forms of governance. Commitment to representative democracy is strongest in North America and Europe. A median of 37% across the 10 European Union nations polled, as well as 40% in the United States and 44% in Canada, support democracy while rejecting nondemocratic forms of government. Australia is the only country outside of North America and Europe where at least four-in-ten are categorized as committed democrats. Sweden (52%) shows the strongest level of commitment of all countries surveyed, with roughly half holding this view. By contrast, Russia (7%) has the lowest percentage of committed democrats. A median of 27% in the Middle East and North Africa are classified as committed to representative democracy. In this region, Israelis (36%) and Jordanians (33%) are most likely to prefer democracy to nondemocratic forms of government. But roughly one-in-five or fewer are committed to representative democracy in Latin America (median of 19%), sub-Saharan Africa (median of 18%) and the Asia-Pacific (median of 15%). In general, public commitment to representative democracy is highest in countries that have a well-functioning democracy. The Economist Intelligence Unit’s Democracy Index is one measure of how democratic a country is. The EIU index ranks countries from 0 to 10, where 0 indicates an authoritarian regime and 10 represents a full democracy. The ranking is based on 60 indicators of a country’s performance across five categories: the electoral process and pluralism, civil liberties, functioning of government, political participation and political culture. The index is closely correlated with our classification of committed democrats. For example, the Netherlands is ranked higher on the EIU index with a score of 8.8, and 47% of the Dutch can be described as committed supporters of representative democracy. Meanwhile, Nigeria has a democracy index score of 4.5 and just 11% of Nigerians meet the committed democrat criteria. 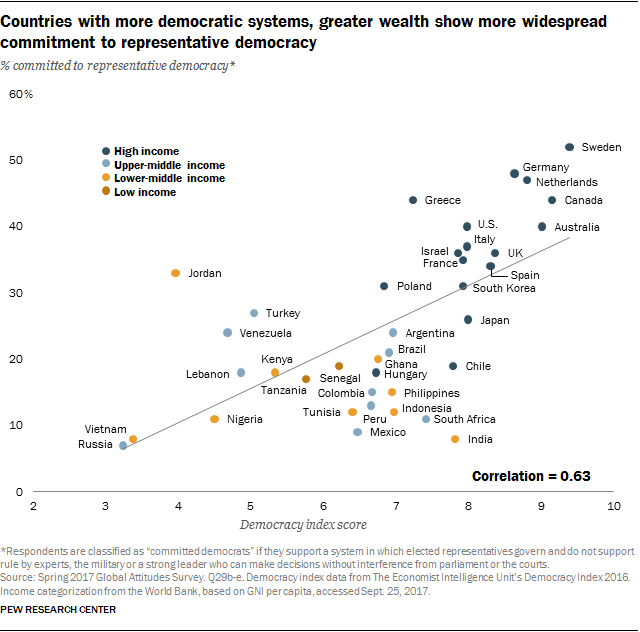 The above scatterplot also reveals another pattern: Countries that are classified as more fully democratic and that have a higher percentage of the public committed to representative democracy also tend to be wealthier. In the scatterplot, the countries are color-coded by their economic ranking from the World Bank, which classifies countries into four income categories based on their per-capita gross national income: high, upper-middle, lower-middle and low income. The group of countries in the upper-right-hand corner of the scatterplot – where the Democracy Index ranking and the percentage of committed democrats are highest – are all upper-income countries. Although commitment to representative democracy is relatively high in wealthy, strong democracies, notable minorities in these types of countries are open to nondemocratic alternatives. Rule by experts has considerable appeal in many of these nations, with roughly half or more in Hungary, South Korea, Poland, Spain Japan, Israel and Chile suggesting this could be a good way of running their country. There is less support for a strong leader who can make decisions without interference from a parliament or courts. Still, about a quarter or more back this idea in Japan, Italy, the United Kingdom, Israel, Hungary, South Korea and the U.S. And while military rule is relatively unpopular, 17% endorse this idea in the established democracies of the U.S., Italy and France. Among the three types of nondemocratic governments asked about, the education gap is largest on rule by the military. People with less education are more likely than those with more education to say a military government would be a good thing in 23 countries. In 18 of these countries, the gap is at least 10 percentage points. For example, in the U.S., 24% of people with a secondary education or less say rule by the military would be good for their country, compared with 7% of those with more than a secondary education. There are also significant ideological and partisan divides in many of these countries on the questions about nondemocratic alternatives. 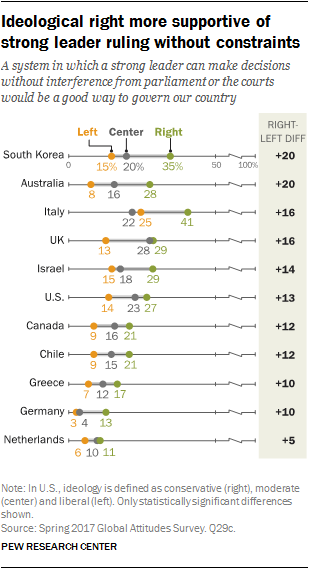 Support for a strong, unchecked leader, for example, is significantly more common on the ideological right in Australia, Italy, the UK, the U.S., Canada, Greece and Germany. The strong leader model also finds backing in Italy among those favorable to Forza Italia, the political party of former Italian Prime Minister Silvio Berlusconi – 43% of those with a favorable view of the party endorse this approach to governing. In Britain, it is more popular among those with a positive opinion of the United Kingdom Independence Party (UKIP). And in the U.S., a third of Republicans say a strong leader who can govern without interference from other branches of government is a good thing, compared with 20% of independents and 17% of Democrats. In 26 of the 38 countries surveyed, people who are satisfied with their democracy are more likely to support representative democracy as a form of government. In turn, satisfaction with democracy varies considerably across regions and countries, and even within countries. People’s evaluations of democracy’s functioning differ considerably based on their economic attitudes and partisan orientations. Overall, a global median of 46% say they are satisfied with the way democracy is working in their country, while 52% are not. Satisfaction is most common in Asia-Pacific and sub-Saharan Africa, and least common in Latin America. In Europe, opinions vary widely across nations. More than seven-in-ten are happy with their democracy in Sweden, the Netherlands and Germany. But two-thirds or more are unhappy in Italy, Spain and Greece – all southern European nations that have struggled economically over the past decade. Views about the economy are strongly related to satisfaction with democracy. In nearly every country, people who say the national economy is currently doing well are more likely than those who say it is doing poorly to be satisfied with the political system. In 29 of 36 countries, the gap in democratic satisfaction between those who are happy with the economy and those who are unhappy is at least 20 percentage points. The gap is largest in Venezuela – a nation beset by economic difficulties – where 72% of those who think the economy is in good shape are satisfied with how democracy is working, compared with only 14% among Venezuelans who say the economic situation is bad. European countries also tend to have some of the largest differences on satisfaction with democracy between those who think the economy is doing well and those who do not, including gaps of more than 50 percentage points in Sweden and Hungary. Satisfaction with the way democracy is working is also tied to how people see the past and the future. In 35 nations, satisfaction is lower among those who think life for people like themselves is worse today than it was 50 years ago. In 34 countries, satisfaction is lower among those who believe children growing up today will be financially worse off than their parents. In addition, people who support the party in power are much more likely to say they are satisfied with the way democracy is working in their country. For example, overall, 46% in the U.S. are satisfied with how democracy is working. However, fully 68% of Republicans hold this view, compared with just 49% of independents and 31% of Democrats.